As a Naturopathic Doctor, I am a huge fan of thorough lab testing to understand what is going on with your health so that we can have you feel optimal and prevent conditions down the line. Testing removes the guesswork from treatment and helps us come up with the best treatment plan for you. Saliva hormone testing is very useful at identifying hormonal imbalances. While clinical symptoms provide some insight into what is going on in the body, testing allows us to get an in-depth look at how your hormones are functioning which will allow for a tailored treatment plan. On top of that, saliva collection is painless and more convenient for you than blood work! Food sensitivities are delayed reactions to specific foods triggered by a production of IgG antibodies. These reactions can occur several hours or days after exposure to an allergen, which makes it so difficult to pin point the culprit. Food sensitivities have been implicated in many health concerns, including digestive concerns, migraines, eczema, joint pain, difficulty losing weight, etc. Blood testing that screens for up to 200 foods is available to help you identify problematic foods. There’s a few ways to test adrenal function: salivary or dried urine (DUTCH Test) being the most common. These tests allow measuring of stress hormones cortisol and DHEAS to get a more complete picture of what is causing your symptoms of stress, insomnia, weight gain, and fatigue. 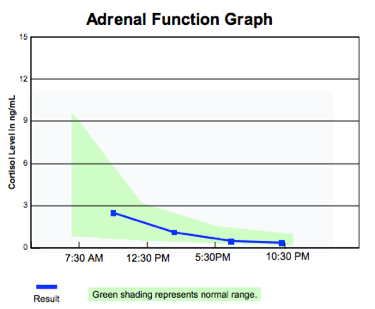 It also allows us to understand which stage of adrenal fatigue you are in, because treatment will depend on the stage. This is one of the most informative hormone tests out there. Dried urine test for hormones and hormone metabolites, which allows a better picture of hormone production, conversion, and use in the body. I like this test a lot because we get a sense of which pathways your hormones are being pushed through and we can modulate that response if it is being shuffled in less-good pathways (I’m especially talking about estrogens and testosterone here). It tests progesterone, androgen, estrogen, and adrenal hormones and metabolites to offer one of the most comprehensive hormone tests available today. The Comprehensive Stool Analysis allows us to objectively evaluate the overall health of the digestive system, including efficiency of digestion and absorption, inflammation, and bacterial imbalances. It gives us information on both healthy and unhealthy bacteria found in your gut so that we know exactly which strain of probiotics you should take. A thyroid panel is a detailed analysis of the thyroid gland and covers TSH, free T3, free T4, reverse T3, and antibodies. Conventional lab testing often only looks at TSH levels which only provides a small picture of what might be going on, and many women go undiagnosed with an underlying thyroid condition because of this. The results of the thyroid panel are taken into account with how you feel in order to provide the most appropriate treatment. Standard blood work can be requested to screen, diagnose, or guide treatment through LifeLabs. Please note that these are not covered by OHIP and prices vary on the requested test(s). Requests may include a CBC, ferritin, thyroid panel, liver and kidney function tests, autoimmune markers, cholesterol levels, blood sugars, inflammatory markers, celiac disease, and much more.